Fixed broadband offers the highest ARPU among the four segments. Dec. 19 2018 — Convergent trends are in full force in Latin America. M&A activity has spiked in the region as operators have struggled to acquire convergent capabilities and scale over the past 10 years. As a result, pay TV, broadband, mobile and fixed telephony have become more intertwined, with most operators offering double-, triple- and even quad-play packages. Kagan's first "Latin America Multichannel & Broadband Market Overview" explores operational and financial trends affecting the telecommunications industry in the region. The report contains sections on the video, broadband, mobile and fixed telephony segments, TV Everywhere offerings, retransmission costs, regulatory frameworks, Ultra HD/4K trends, partnerships with SVOD providers, profitability, capital expenditures and M&A, as well as profiles, including footprint maps, for the top 10 telecommunications groups offering multichannel products*: América Móvil SAB de CV, Cablevisión Argentina, Liberty Latin America Ltd., Megacable, Millicom International Cellular SA, Telefónica SA, Grupo Televisa SAB, Oi SA, Entel Chile and AT&T Inc.'s DIRECTV Latin America LLC. The report also includes a telecommunications-statistics Excel workbook containing historical metrics starting 2011. The workbook allows a deep dive into group-level operational and financial metrics such as subscribers, average revenue per user, EBITDA and CapEx. The report also includes debt metrics for selected operators. Kagan estimates multichannel remains the top revenue generator for fixed services. Broadband, the fastest-growing segment, came in a close second. Total telecommunications revenue for the top ten groups in 2017 was an estimated $98.85 billion with mobile services generating more than half of the revenues. Already a client? 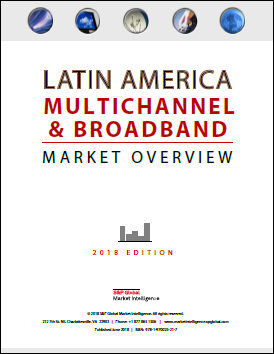 Click here for our exclusive report, "Latin America Multichannel & Broadband Market Overview," with a summary presentation of multichannel and broadband revenue trends and other core industry statistics. Fixed telephony, though declining, is still a significant cash generator. AT&T leads the multichannel segment in revenues and ARPU. Profitability is recovering. Mexican multichannel operators have the highest profitability. Capital expenditures per primary service unit are trending down. The fixed and mobile services segments appear to be returning to a growth trend after subscriber and revenue losses in 2015 due to the economic slowdown in the region. There was robust performance in 2017 compared to the prior year, especially for multichannel, which saw revenues grow for the first time in three years, although remaining below the 2014 peak. Already a client? Click here for the full report in PDF and Excel editions. * The report excludes TIM Brasil because the operator does not provide pay TV services. Global Multichannel is a service of Kagan, a group within S&P Global Market Intelligence's TMT offering.